In Church, we have this term that is used quite a bit, it’s called ‘carrying.’ This usually refers to what people are put on this Earth to achieve and do, for example in context, someone may say; ‘You carry a heart for children.’ This is a bit general, but basically means that whatever you’re put on this Earth to do is probably something to do with children. In secular society, there’s quotes that float around saying something like; if you keep your eye on your passions or whatever makes your heart happy, then you’ve found you purpose. This is basically the equivalent to ‘carrying’ something. Anyway, now that that’s out of the way, why am I talking about what people carry? Well because, whether you go to Church or not, or have a faith, or not, as human beings, we like to have a meaning and a purpose. It is what drives us and motivates us to get up every day and live life, otherwise most of us would just stay in bed. Your purpose could be to travel or to teach, it could be one of those lives that people long for; island hopping and earning money while living in a van, or it could be a more traditional occupation. Either one is completely okay. I have friend who could not think of anything worse than backpacking around Europe for a summer, especially without staying in a 5-star hotel and I have friends that absolutely love hostels and camping and would happily sleep in a box in the middle of the desert, either is a completely okay lifestyle to live. But when you don’t know what you’re carrying or what your purpose is, this can be a confusing time. For me, personally, I know I can look around at other people surrounding me, see them being successful in their chosen career or field and almost convince myself that’s what I should be doing too. It’s almost like wearing another person’s wardrobe and their personal style doesn’t feel quite as comfortable on you as it looks on them. Everyone is carrying and has a purpose for something and sometimes you’ll meet like-minded people who have the same vision or goal, buy you each bring something unique to the table. Carrying something doesn’t mean it will be easy, but it means you’ll have natural skills in that area, even if they need development. Maybe you’re really good at talking to people you don’t know and making them feel comfortable, or maybe you’re really good at organising things and getting things done to a schedule, or that you can easily distract any toddler about to kick off in a 5-mile radius. These skills, you just ‘happen to have’, may be something you can use for your purpose. It may look like other people have the success you want, whatever success means to you, however everyone’s success looks different. Maybe it’s been able to put down a deposit on a house or go on holiday easily 2 times a year, maybe success to someone is creating and building their own business, for someone else it could be holding a job for more than a year. Success shouldn’t be a word saved just for entrepreneurs and people who own million-dollar companies. Everyone can have success. But not everyone is carrying the same success, which doesn’t make anyone better than anyone else. 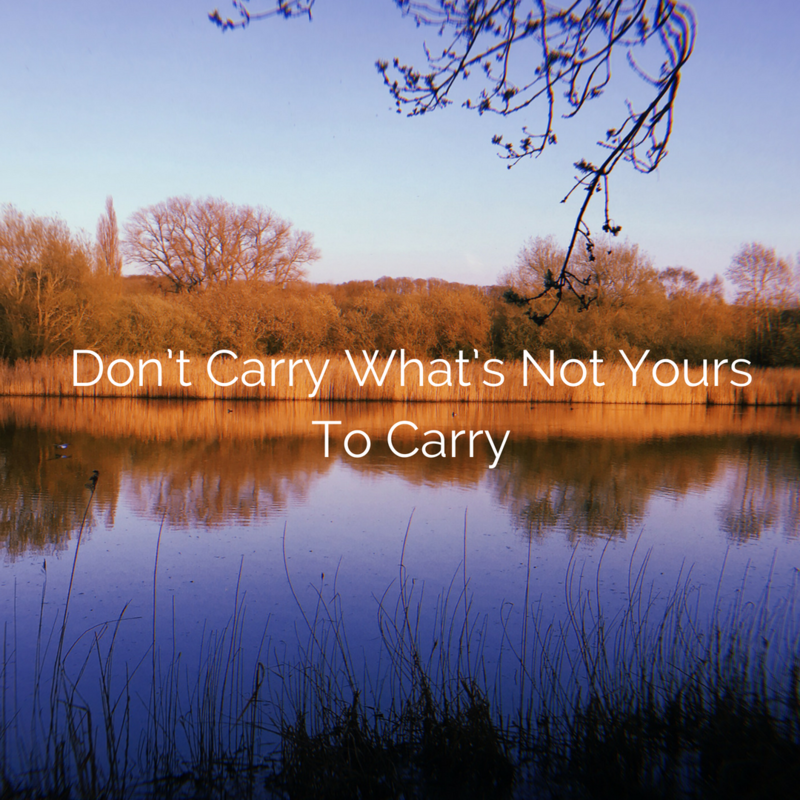 Are you carrying something you know isn’t meant for you? Does it feel forced and your hearts no longer in it? Or maybe you did something to please someone else and here you are? Maybe you don’t know what you’re carrying/what your purpose is at all? So how do we put down what isn’t meant for us? Well, first you have to accept it’s not for you. That you have something else to offer the world and you just have to either find out what that is or be brave and bold enough to go after it.